Club members will be packing kits for the School Technology Tournament at their meeting on 13th March. The Tournament, held jointly with the Whitby and District Rotary Club, is to be held on 21st March at the Whitby Spa. Teams from local secondary schools will be faced with a design and build challenge. 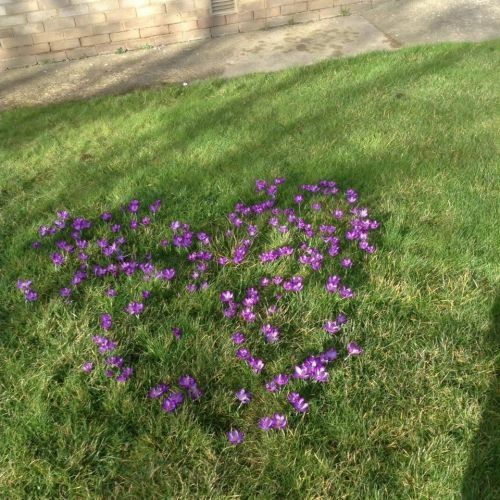 In 2018 the Club helped Salvation Army Kids Club members plant crocus bulbs at East Side, Whitby. They have now flowered and look lovely in the sunshine, and are helping to eradicate polio world wide through Rotary's ongoing campaign. 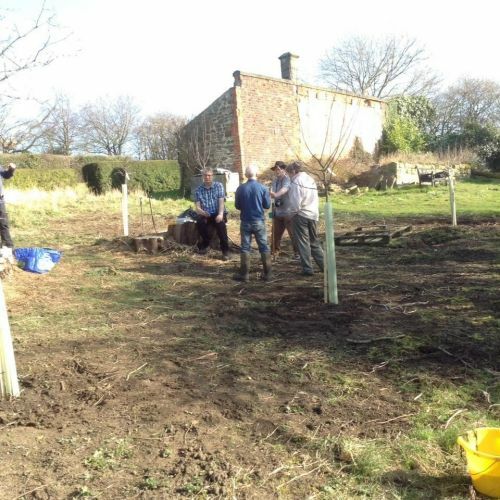 Club members are planting fruit trees at the Community Garden at Larpool Hall, Whitby as part of the Club's long term project to renovate the former walled garden. Rotarian Sue Morton gave club Members an interesting and thought provoking talk regarding the German occupation of the Channel Islands between 1940 and 1945. The Islanders suffered considerable hardship due to both repression of their freedoms and starvation. Club members were asked what they would do in similar circumstances - resist (and risk severe punishment or death) or comply? Ed Horwood of the North Yorkshire County Council Youth Service came to the Club in February to give a most interesting presentation on the Pop-up Workshop Project for young people which he is running. The Club will be pleased to assist in any way possible in forthcoming months. 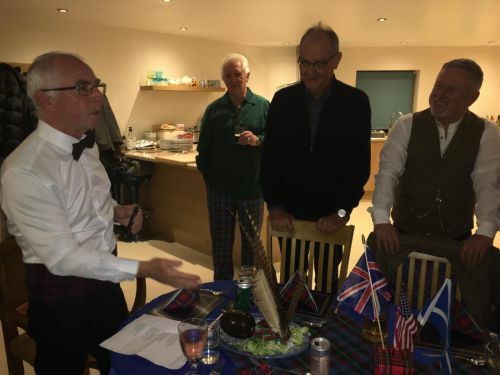 Addressing the Haggis at the Club's Burns Night Supper for members and guests. Whitby Endeavour Rotarian Dag Kjelldahl received a Commendation from the North Yorkshire Fire and Rescue Service for his actions when his neighbours house caught fire. Congratulations! The Club has also continued to support the Empty Chair Bereavement Service of Whitby from the same source. 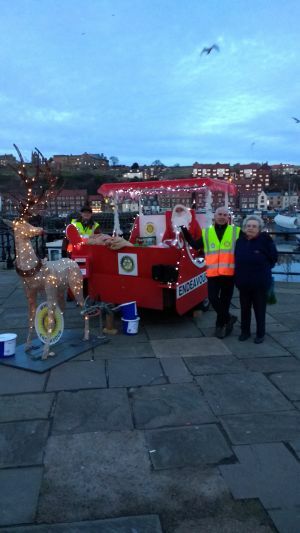 Whitby Endeavor Rotary brought Santa and his elves to Whitby, Hinderwell and Staithes. Lots of local children had a chance to speak to Santa and promise to be good! Thank you for your support for the Whitby Endeavour Rotary Quiz held at the Whitby Conservative Club on 5th December. All proceeds will be used to support the Brains Trust and other Rotary projects and charities. Thanks to all who stood and packed bags today. The total raised is £375. And those who helped at the Beer Festival the Lions were most grateful. The annual Whitby Endeavour Rotary Club young engineers’ competition has taken place with the support of a grant from the Sirius Minerals Foundation. 36 primary school students, aged 10 and 11, from seven schools in the Whitby area took part in the project, which involved designing and building a miniature working lighthouse. The teams, from St Hilda’s, St Hedda’s, Airy Hill, Castleton, Seton, Ruswarp and Glaisdale schools, spent several weeks each constructing a lighthouse in preparation for showcasing during a testing day at the Robinson Institute in Glaisdale. 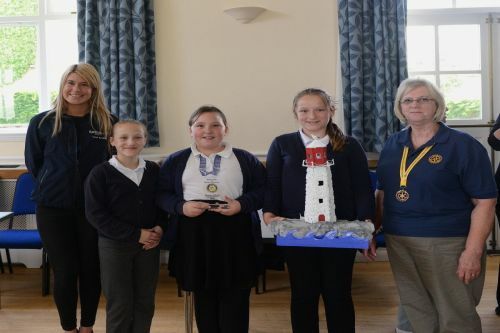 The entries were judged by volunteers from the H.M Coastguard in Staithes, who gave a presentation about water safety, and prizes for the winners and runners up were awarded by a representative from Sirius Minerals. 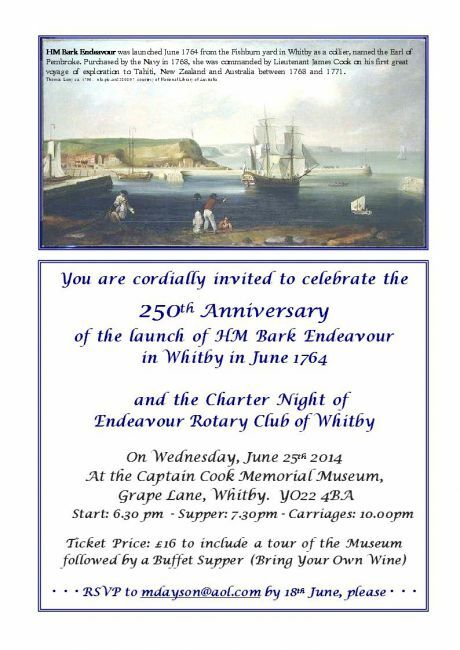 The ‘sea-themed’ event marked the 250th anniversary of Captain Cook’s first expedition to the South Seas from Whitby. 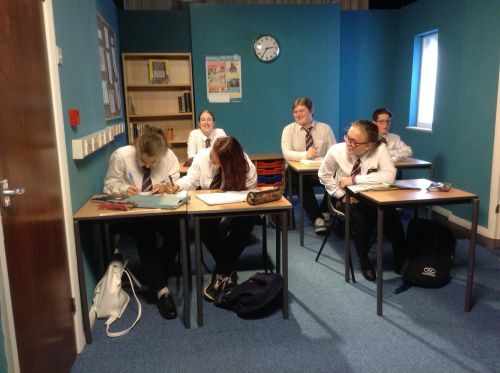 “The lighthouse testing day was fantastic event and a wonderful opportunity for schools to get together. Because of the smaller size of some of the primary schools, teaching STEM subjects can be quite a challenge, so we were delighted with the high standard of entrants which really showcased the fantastic skills of young people in the area. Choosing a winner was not easy, but Seton Community Primary School in Staithes took the prize. We would like to thank the Sirius Minerals Foundation for the grant, which enabled us to purchase the building materials, build kits, and trophies for the students to take part." The Sirius Minerals Foundation is an independent charity which has been set up to support a wide range of projects that benefit the local community. The Whitby Endeavour Rotary Club was one of seventy-five local charities, educational establishments and community groups which shared a pot of around £300,000 as part of the Foundation’s first round of funding. Members of Endeavour Club spent a very enjoyable evening last week at a Quiz Night in aid of The Brains Trust and other local charities. The Brains Trust raises vital funds for brain tumour research. Many teams took part and a good supper was provided by members. Looking forward to another Quiz Night in 2018. The Endeavour Sleigh rides again. Our Santa Sleigh led to Whitby Town Parade on Friday 17th for the Town Christmas Fare. 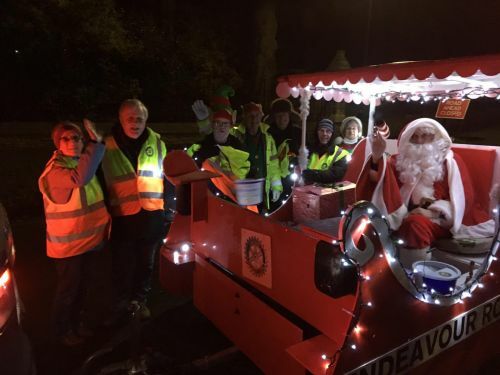 Members of Endeavour collected all week end with the Sleigh supporting local Charities. Friday 1st December the Sleigh is visiting Hinderwell and Staithes. Wednesday 6th Whitby east Side and the East Side community centre family club. Saturday 9th Station car park, Saturday Sunday 16th 17th Whitby dock end . 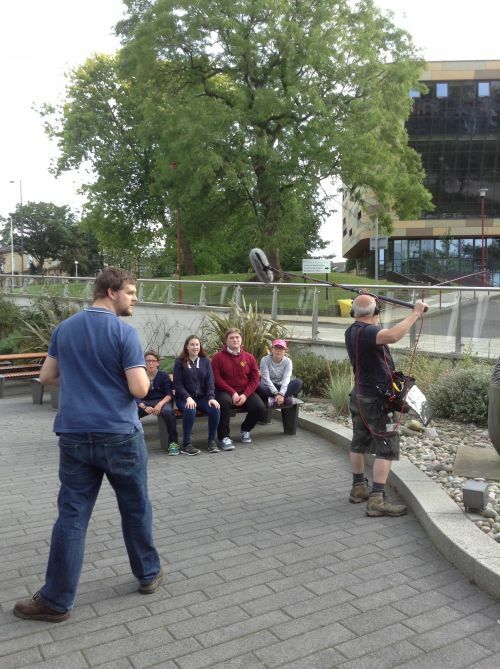 The young carers film is finally finished after a year's work with the Bradford University Film and T.V. professionals. The Young Carers had a very exciting day at the T.V. studios and the final outcome had it's 'red carpet' launch at the Stephen Joseph Theatre in Scarborough last week. The film explains the daily lives of young carers and is soon to be launched on 'the web' and then used by the 'We Care' organisation to promote understanding of the hectic lives of Young Carers. Club president and Endeavour members attended the Remembrance Day service and laying the Club wreath at the Town memorial. These will be collected at 1p.m. They will then become part of a larger load going to Thessaloniki, Greece. Here they will be distributed to the refugees who are living in tents and warehouses with little or no facilities in sub-zero temperatures. Ideally it would help if people shared car space to take the items to Burniston. However, Endeavour Rotary Club Whitby have volunteered to pick up and transport items to Burniston from the Coliseum. Scarborough Friends of Refugees on Facebook. Thanks to the people of Whitby and the many visitors who helped with all our efforts. Overall we raised £1,153 for charities supported by Rotary. The sleigh was a great success and many adults as well as children climbed aboard and had photos taken with Santa. We saw many happy and smiling faces on young and old, especially on the night we toured Whitby's East Side and so many children came racing out of their houses. What an exciting time of year for all of us! 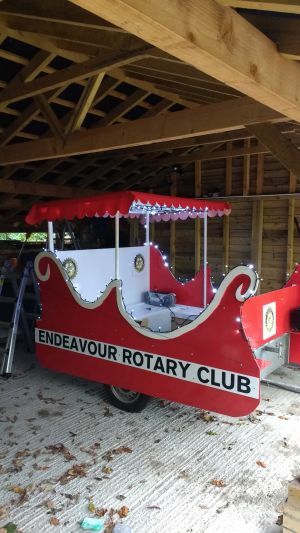 We have recovered the costs of building the sleigh and are now raising cash for charities supported by Rotary. The families on the East side of Whitby really appreciated seeing Santa and his sleigh touring their streets and we collected £105.49. Thanks to all. Our display outside the Co-op (with thanks to Northern Rail for the use of their car park) raised £523.60. Families and all those out shopping were full of smiles!! Christmas is a busy time of year for everyone, but this year our members have been especially busy. Sleights has echoed to the sound of woodworking, painting, electrics and installing a sound system into SANTA'S NEW SLEIGH. The sleigh's first outing is on Friday November 18th at the Whitby Christmas Festival. Members will be acting as stewards for the procession thro' town from Pannet Park to the Marina Car Park where Santa, his sleigh and an illuminated reindeer will be waiting to entertain the children. We will be there all day Saturday and 10.00 til 4.00 on Sunday. Further outings over the Christmas season will be held on the dockside, railway station and a tour around the streets of East Whitby on Wednesday December 7th. A fun competition for all local Primary schools. All local schools have been invited and those taking part will be sent their kit of parts and an explanatory pack in early May. Schools are studying the Olympics, Ancient Greece and electricity this term and the task is to include elements of each aspect. Motors, batteries, LED's, wheels and pulleys are all supplied. Each year pupils come up with the most imaginative ideas and we are sure this year will be no exception. After work in schools the 'Grand Final' will be held at Sneaton Castle on Thursday June 23rd. The feed back sheets from pupils were very helpful. All pupil sheets rated enjoyment, fun, organisation 9/10. Staff likewise thought pupils gained a considerable amount of knowledge and worked together in teams very well. As a follow-up Rotary is organising a follow up visit to the Electricity turbine in the River Esk at Ruswarp for all pupils who took part in the event. thanks to all who worked so hard on the day. Over £300 was raised for Rotary Causes. Do you have CRAFT SKILLS? about Sand Dams and the benefits they bring to the 3rd world. Join us and enjoy a few hours of fascinating music and company from around the world. Friday, Saturday and Sunday 11th, 12th and 13th October. the building merchants to raise awareness of the dangers of High Blood Pressure. On Tuesday 7th October we are manning a stand in Jewsons, Whitby, with the help of a qualified nurse inviting customers to check their B.P. with an unusual night where guests were invited to the Captain Cook Museum in Whitby for a private tour of the museum followed by a buffet supper. A competition for local Primary Schools. 12 local schools have been issued with a challenge! Given a kit of bits and pieces they have to design and build a launcher. The theme of this year's competition is a space capsule launcher. The winning team will have launched their capsule (an 'air' type golf ball) highest, and produced a portfolio of their work. A thoroughly enjoyable afternoon for pupils, teachers and Rotarians! Endeavour Club welcomes Rotarians and supporters from Beverley Club at the end of their cycle ride in aid of Emergency Boxes for victims of East Coast Floods. One of our main fund raising events. From 9.00a.m. til 6.00p.m. approx. At our AGM which marked the end of President Elsie Smith's year in office, we listed the Club's activites for the year. As always, much of our work supports the local community . Below is just a selsction of the work which Enbdeavours members have been involved in. Design and Build Competition for Whitby Primary Schools - a first and successful competition SEE BELOW! Pat Charlesworth is a member of Whitby Endeavour Rotary Club and a holder of Rotary's Paul Harris Fellowship, She and Harry Collet of Whitby and District Rotary Club were recently granted Honorary Citizenship of Whitby by the Town Mayor at a ceremony in Whitby's Coliseum. Pat spent 37 years as an officer of the Salvation Army, working in some of the most deprived areas of England, and in Northern Ireland at the height of the bombing campaign. In 1992 Pat and a colleague set up an intensive support centre in Whitby which works with disadvataged families and childre, providing support, lunch clubs, hobby classes and children's clubs as well as a partuy on Christmas day. Although 'retired' and suffering bouts of ill health, Pat continues to serve the community in mnay ways including running the bereavement counselling group known as 'The Empty Chair' which has helped thousands of people through this most distreesing time. 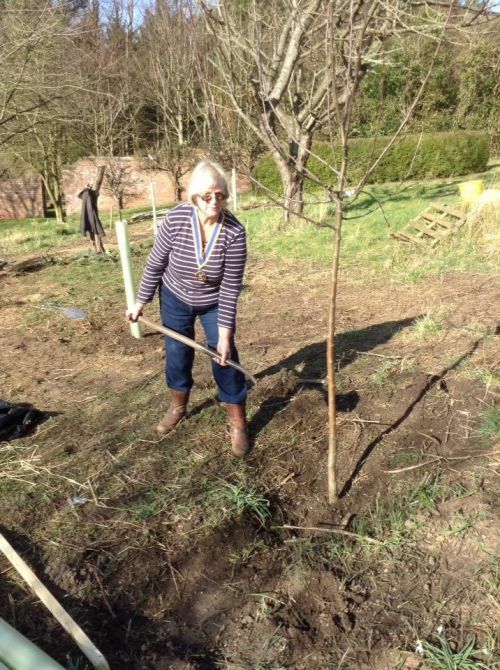 Because of her selfless work in the community, which embodies all Rotary stands for, she is much loved and values by countless numbers of the those she has helped. On Friday 31st May a large group of Endeavour members met to paint and renovate a warehouse that is being made available as a furniture store for Whitby Network charity. Rollers, paint, dustsheets and overalls to the ready for a day's hard work. Laughter and chat freely available from club members!!! This year we have promoted a new DESIGN AND BUILD competition for local primary schools. We have been involved, jointly with Whitby and District, with 1040's Technology Tournament for several years and regard it as a very worthwhile youth project, and certainly one that the young people enjoy. All local primary schools werecontacted. The task involved building a structure from paper, card, balsa and everyday materials to bridge a gap between tables. The best entry from each school was brought to Sneaton Castle for a GRAND FINAL on Thursday 20th June. Seven Schools were involved and all the pupils and teachers throroughly enjoyed their day. New Generations project in the Whitby area. Primary and Secondary Schools have been circulated with details and enquries are positive so far. The theme of 'PEACE' can be interpreted in many ways: from 'a state that exists in the absence of war' to 'making Mum smile'. We look forward to some interesting entries! Esk Valley Schools get the Olympic Spirit! Several small village schools in Whitby's Esk Valley cooperate in a cluster group to enhance the overall education of the primary children within their schools. On Thursday July 5th 2012, the schools held a celebration of all things Olympic at the North York Moors National Park Centre, Danby. 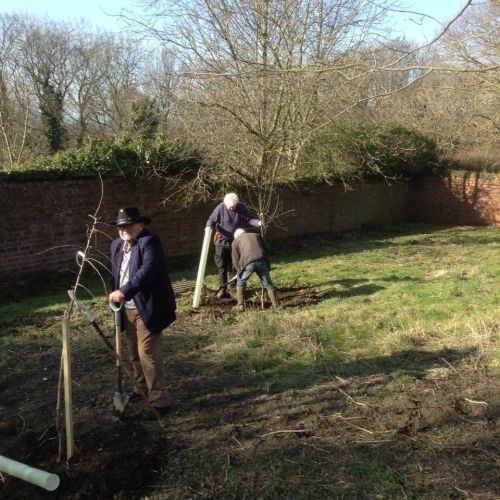 Endeavour Rotary club was involved from the beginning as part of our Youth Work. The youngsters from all 7 schools were mixed into teams representing twelve competing nations. To enhance the day and provide publicity for Rotary, Endeavour paid for over 250 tee shirts in 12 colours. The weather was kind, in the middle of a very wet season. Parents, Rotarians, teachers, other staff and children enjoyed a fabulous day which included drumming, dance and lots of BBQ food as well as races. All in all, a great day! We had a spendid day! All were exhausted by 7.00p.m. and ready for a trip to the nearby Indian Restaurant. Magnificent sum of £1,100 raised. Thanks to all for such a great effort!! 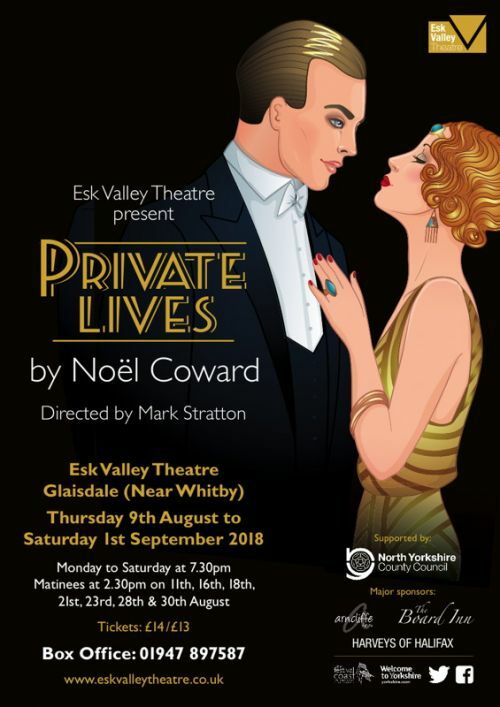 In May 2012 Endeavour staged an exhibition of the various activities we help with, both in the Whitby area, and projects we are involved in the wider world Many people took a moment when walking through town to see the variety of worthwhile and fun activites we have helped with recently. Endeavour joined forces with Macmillan for a sponsored walk from the Leisure Centre in Whitby round a circular route via Sandsend. Members manned checkpoints and a few adventurous types did the walk. Young Carers filmThe young carers film is finally finished after a years work with the Bradford University Film and TV professionals.The Young Carers had a very exciting day at the TV studios and the final outcome had its Red carpet launch at the Stephen Joseph theatre last week. The film explains the daily lives of young carers and is soon to be launched of the web and used by the “We Care organisation” to promote understanding of the hectic lives of Young carers. Sent on Behalf of President ChrisThanks to all who stood and packed bags today.The total raised is £375.And those who helped at the Beer Festival the Lions were most grateful. Copyright © 2011 - 2019 Rotary Club of Whitby Endeavour. All rights reserved.